Callum Connolly’s first goal for the Blues in the fifth minute saw Town to a 1-0 victory over Derby at Pride Park, extending Town’s unbeaten run on Rams’ turf to 10 games and 11 years, the last three all ending 1-0. Connolly flicked home a header from a Martyn Waghorn corner on the right and despite spells of Derby pressure, the Blues hung on to claim all three points. Joe Garner was a notable absentee from the Town attack. The former Rangers striker has been managing an ongoing shoulder problem since pre-season, but it's understood it’s not that forced him to miss the game. Young striker Ben Morris was subbed at half-time in yesterday's U23s draw at Charlton in order to be a late addition to the travelling party. Emyr Huws was handed his first start of the season and Jordan Spence and Bersant Celina returned to the team, while Dominic Iorfa and Freddie Sears dropped to the bench. Derby were unchanged for the third game running with former Blues loanee Tom Lawrence starting. It was Lawrence who made the game’s first attempt at goal in the fourth minute, but the Wales international mistimed his header from Andreas Weimann’s right-wing cross and sent the ball very wide of goal. A minute later, the Blues took the lead. Ward won a corner on the right with Town’s first attack, Waghorn whipped the corner in to the near post and Connolly flicked it goalwards. 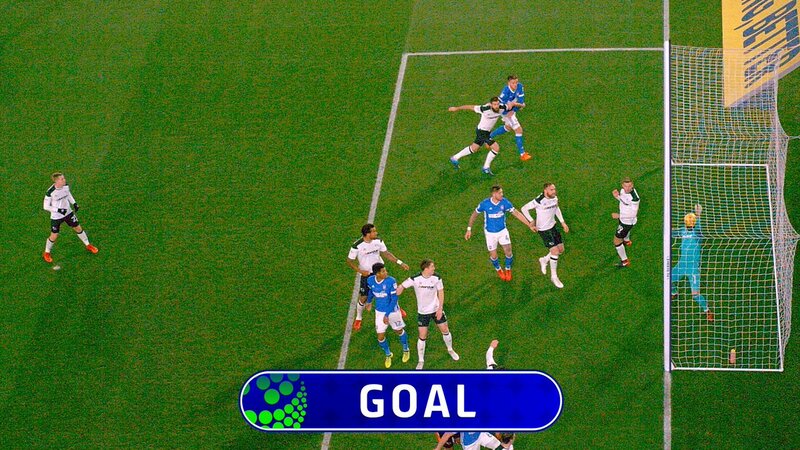 The ball struck the underside of the bar, Scott Carson in the Derby goal pawed it away, but referee Scott Duncan signalled that Hawk-Eye had indicated that it had already crossed the line. All the outfield Town players joined in celebrating the on-loan Everton man’s first goal for the Blues. But for the technology, it’s unlikely that the officials would have given the goal with neither official appearing to react as if they had initially thought it had gone over the line. The goal led to a few nerves in the Derby side with the ball given away needlessly on a number of occasions in the minutes after the Blues had gone in front. However, skipper Luke Chambers was forced to make an important challenge midway inside the Blues’ half with Matej Vydra otherwise away and in the clear. On 12 Ward wasn’t too far away from a second with an overhit cross which Carson confidently allowed to pass his post, although perhaps rather more closely than he had probably anticipated. Town were defending solidly, working hard, keeping the ball confidently in spells and breaking quickly when they could with Derby having much the greater share of the possession but without being able to find a way through. The Rams carved out their first real opportunity since going behind as the game reached the half-hour mark, Lawrence crossing from the left and Weimann volleying well over when he will feel he ought to have done better. Three minutes later, Lawrence was booked for diving after going to ground rather dramatically as he took the ball past Chambers inside the box on the Rams’ left. It appeared Lawrence had run into the Town captain to try to draw the foul and then made far too much of any contact there was. Curtis Davies stabbed a Lawrence corner from the left against Huws in the 37th minute with the Blues continuing to remain resolute in defence but by now threatening more rarely at the other end. However, on 42 Celina sent Ward away down the left and the ex-Spurs man won a freekick from which Huws saw a header blocked. As the half moved into one minute of additional time, Weimann out-battled Webster and hit a shot which deflected wide but Town saw out the remaining seconds of the half to go in a goal up at the break. Having gained the early lead from another excellent Waghorn set piece and Connolly’s equally impressive flicked header, the Blues were able to sit back and challenge Derby to break them down. The Rams had really only managed to create a couple of chances, Weimann’s volley over and Davies’s blocked effort from the corner. Town had continued to look dangerous on the counter-attack and had also had spells of possession of their own but without having been able to conjure up a second goal. Derby swapped the conspicuously quiet David Nugent for Suffolk-born ex-Norwich striker Chris Martin at half-time, the one-time England man having been unable to add to his previous 15 goals in 15 games. The Blues carved out the first chance of the second period a minute after the restart, Ward’s cross from the right reaching Connolly beyond the far post from where he hit a shot which was blocked by Carson. The once-again-impressive Connolly was fouled by Tom Huddlestone midway inside the Derby half on 48. Waghorn played the ball wide to Celina, who lost possession and Weimann broke quickly. Eventually, the ex-Aston Villa man played the ball back to Huddlestone on the edge of the box and Bartosz Bialkowski superbly saved away to his right, the ball appearing to have caught a Town defender on its way through. On 55 Knudsen gave the ball away to Vydra midway inside the Town half and the Czech international brought it inside and found himself space before hitting a low shot wide. Three minutes later, Chambers was booked for a foul on Lawrence as Derby broke, Bialkowski confidently palming Vydra’s low freekick to his right away from goal. Right on the hour, Town swapped Huws - who had done well on his first start this season - and Celina for Sears and Flynn Downes, just before Davies misjudged a long ball down the middle but Waghorn was unable to connect with an acrobatic effort towards goal. Webster joined Chambers in the book on 64 for taking down Richard Keogh five yards outside the area as the Irish international broke forward. The card is the Blues’ captain’s fifth of the season and he faces a one-game ban. The freekick was played short to Vydra but his shot flicked off the Town wall and looped behind. For the first time Town were finding themselves under sustained pressure but so far they were holding onto their lead but with breaks towards the other end less frequent. Derby swapped Weimann for Jonny Russell as the match moved into the 70th minute, then two minutes later Tristan Nydam took over from goalscorer Connolly for Town. Soon after the change, Ward wasn’t too far away from adding a second for the Blues with a chipped effort from an angle on the right but the ball looped beyond the post. At the other end, Cole Skuse made an important interception - hardly his first of the evening - as Lawrence looked to receive a pass on the left of the area. In the 75th minute Town looked to have a very decent shout for a penalty when Waghorn was felled in the area as he tried to take the ball past Davies on the right. Referee Duncan appeared uncertain and took the advice of his assistant who gave a corner, much to Waghorn’s frustration. The Blues had weathered the spell of Derby pressure and were more in the game again, even if the Rams were still having most of the ball. On 82 Downes was booked for kicking the ball away after Spence had been harshly adjudged to have given away a foul 30 yards out to the left. The 18-year-old is also banned from Saturday's game against Forest. Lawrence’s freekick flew harmlessly wide. Derby went somewhat closer two minutes later when Vydra deftly exchanged passes and broke into the box but somehow stabbed past Bialkowski’s right post when he seemed certain to level. Rams sub George Thorne claimed a penalty in the 87th minute as he took the ball past Skuse but referee Duncan waved away his protests. The former West Brom man looked to have made a lot of nothing. There was a big scare for the Blues a minute later when Sears lost possession on halfway and Derby broke. Eventually, Russell crossed from the right and Joe Ledley smashed high and wide from a tight angle beyond the far post. Rams keeper Carson went up for an injury time corner which the Blues repelled and moments later referee Duncan confirmed Town’s third successive 1-0 win at Pride Park, which continues to be a happy hunting ground for both the Blues - unbeaten there in 10 back to 2006 - and McCarthy, whose last loss at Derby was at the Baseball Ground with Millwall in 1995. For once Town's great nemesis Nugent was unable to make any impact and fell to a defeat to the Blues for the first time. Having got their lead, Town defended resolutely for the most part, while Derby will feel they had opportunities they should have taken. The Blues remained a threat on the break for much of the game and might even have added to their lead with Waghorn’s penalty claim appearing the strongest of the game’s three. Winning their long-awaited game in hand sees the Blues move up only one place to ninth but now only three points from the play-offs with Nottingham Forest, who they have pushed into 10th, at Portman Road on Saturday. Derby County: Carson, Forsyth, Keogh (c), Lawrence, Baird, Weimann (Russell 70), Vydra, Nugent (Martin 46), Davies (Thorne 83), Ledley, Huddlestone. Unused: Mitchell, Wisdom, Pearce. Town: Bialkowski, Spence, Chambers (c), Webster, Knudsen, Skuse, Connolly (Nydam 72), Ward, Huws (Downes 60), Celina (Sears 60), Waghorn. Unused: Gerken, Iorfa, Bishop, Morris. Referee: Scott Duncan (Northumberland). Att: 24,475. WELL DONE ALL - GREAT RESULT. Wow!!! Fantastic result, did not see that one coming and suspect not many did. Competed in the first half by all accounts and rode our luck on a few occasions in the second, but who gives a flying one cause there’s no doubting it, that’s a massive result away at Derby. We are at the end of November and most of the talk is on the playoffs, not relegation, so progress has definitely been made. We have a capable team in most departments, even more so with Huws & Bish returning. Are we over achieving?? I personally think not. Who said we couldn't rely on the game in hand being worth 3 points. Well done all. Excellent result and without doubt the best result of the season. Just like last. Amazing record at Derby continues. Let’s hope, unlike last season, we push on from this win. Sounds like Skuse and Chambers were excellent. Good to hear! Game in hand 3 points!! Where are the moaners now? Fantastic performance from the whole team.Defended well and Bart once again outstanding.A very happy cold drive home but well worth it.Just hope we can do the same Saturday. Swn98 ........... be happy you miserable Basket - sarcasm has to always come into your posts unfortunately. Your first five words were fine - but that's about all we could expect from you I guess. Results like this are a great reward for sticking with Town. No doubt there will be a few of the moaners crying in their beer tonight. 29 points from 19 games is indeed progress whatever we think of MM. Rensham ......... at his best again .... !! - expect no more from there either. Footballo89 I could’nt have put it better. ....... Blueboy - self analysis ??? How do we go from defending like that against villa to this against Derby. Probably points to why we are a mid table team. But what a fantastic result with the game in hand. I’m still firmly fed up with Mick and can’t wait for him to go but to be fair he deserves the credit tonight. He got the team set up and well organised and it has paid off! Well done! Truckerblue ... Scott Duncan 1937 - 1955! Four games away from the midway point of the season and we are three points off the play-offs - despite having hardly any central defenders and then hardly any central midfielders and now hardly any strikers. All this on a budget a fraction of almost everyone else's in the division. There's no-one above us who has spent less in the past two seasons. And we're scoring freely. And we're playing Academy kids. Anyone would think we have one of the most experienced Championship managers around, excellent at operating on a shoestring?